I have a friend who bumped into a couple at a bar. They were drinking pints and discussing points over, what appeared to be, a map. 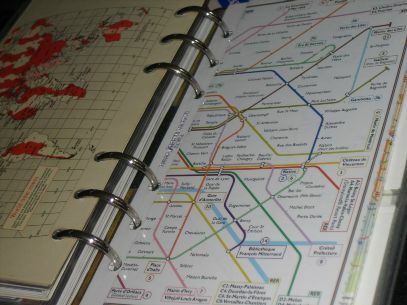 And, it was: A map of the Buenos Aires underground-Subte lines. When asked whether they needed help getting somewhere, they simply replied, no, thanks. Apparently, every city this couple travel to they take a full day to experience the underground transit lines. Nothing could be more strange, yet appropriate. The different levels of a city reflect different sides of its culture. Above ground is the skin, the aesthetic of a city, where colonial architecture, green parks, and streets scattered with cafés promote the extroverted cultural vibe. However, the blood of the city, its pulse and life, occurs below the surface. The underground-train is how the commoners commute and how the locals get around. The lurkers of the underworld hustle and bustle below leaving the above ground for foreigners and tourists. A recent article in the Financial Times explores the lifeblood of Paris, the underground train called the Métro. Contrast to London´s Tube, the Métro is a ¨more grown-up¨ transit-system that the French take pride in. The stations are cleaner, extravagantly themed, comprehensive and reliable. And, why not? The very essence of a city is the movement of its people. My biggest pet-peeve in a city is a transit fail. Although accidents do happen and delays cannot be predicted, I find myself frustrated by chronically tardy, thus unreliable, metropolitan transportation. A city only thrives and grows when its people are doing things. Due to population density, primary and secondary industries are impossible in a city which make tertiary services, an industry that requires mobility, the only option. I know that a city is going to be boring when its transit is crap. Perhaps the Métro is the very reason that Paris persists as the number one tourist destination in the world: the people can move throughout the city with ease. Even Julian Pepinster, a devout Métro-rider followed in the article, takes the underground ¨just to relax¨. Wouldn´t that be nice?